Of the 5 races currently planned for the Alpha test, the last of the soldier combat animations is finished… this one is for the Alkari. Next up are the remaining 12 planetary landscapes. There’s still a long way to go, but every step makes the finished product that much closer! — Planet displays… for various UIs that show a colony on a planet, I’ve integrated an early pass of the new Terran graphics which have separate layers for the terrain, sky and clouds. It will create a more varied look among planets as opposed to the static images in the original game. As you may have noticed by now, the colony fortress is now different for each race. — Ground Combat UI… integrated animated soldier graphics and colony fortresses from Petar, only the Alkari remain. All of the weapons have different sound effects. There is an animation to the screen showing the transport ship descending and then a hail of gunfire as the combat as resolved. All of the animation can be skipped, of course. To do: I’ll need various death animations for the soldiers as well as different weapon effects. Those will be done when artwork is ready. — Bomb Colony UI… this is where you are prompted yes/no to bomb an enemy colony when you have bombers in orbit. Currently, you have an orbital view and the ship descends to the planet when the bombing starts. To do: Explosion animations on the planet. Before doing this, I have some picky things to figure out to ensure that the bombs fall on land areas (think about Ocean planets). — Colony Getting Bombed UI… this is the display that shows your colony when it is getting bombed by an enemy. Unlike the previous, this is not an orbital view but shows your colony. The sound effects and explosion animations worked out really well here. To do: Integrate some “destroyed’ versions of the colony fortress images for those times when your colony gets obliterated. — Alien speech… I’ve finished the coding to support alien speech for the various diplomats. Basically, it allows a collection of syllables that are strung together to represent the speech, and the diplomat animates talking exactly as long as the randomized speech is playing. I’m using Esperanto for Human speech and it works pretty well. I’ll probably be cobbling together speech for the rest of the races over the next few days. Up Next: Detecting End game conditions and switching to appropriate information screens when they occur. Illustrations for these screen to come much later. This should probably take two days at the most. It will be nice to do something a little simpler! I think I’ve scheduled the Galactic Council to be done in November along with starting all of the Diplomatic Treaty code. There’s a lot of work left to do before the Alpha, but everything is still moving along pretty nicely! The original plan was to have it ready sometime in 1Q 2016, and I think that’s still a reasonable estimate. Nothing is set in stone, of course. 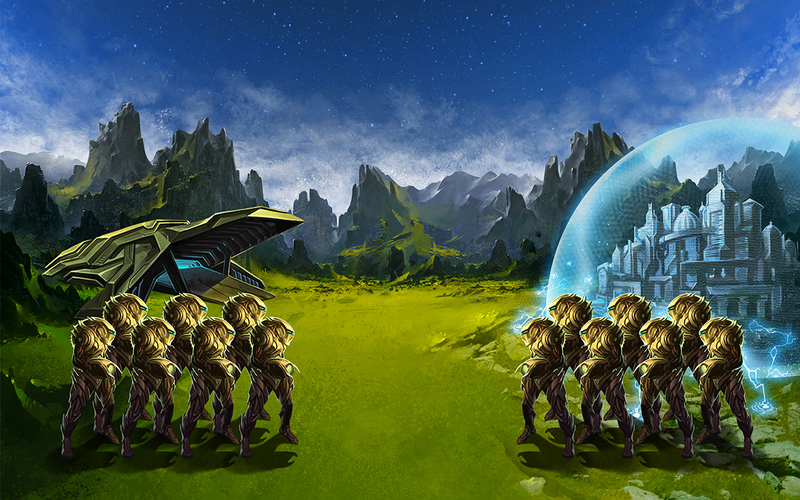 The artwork for the animated Psilon soldiers and their fortress is complete and integrated into the game. 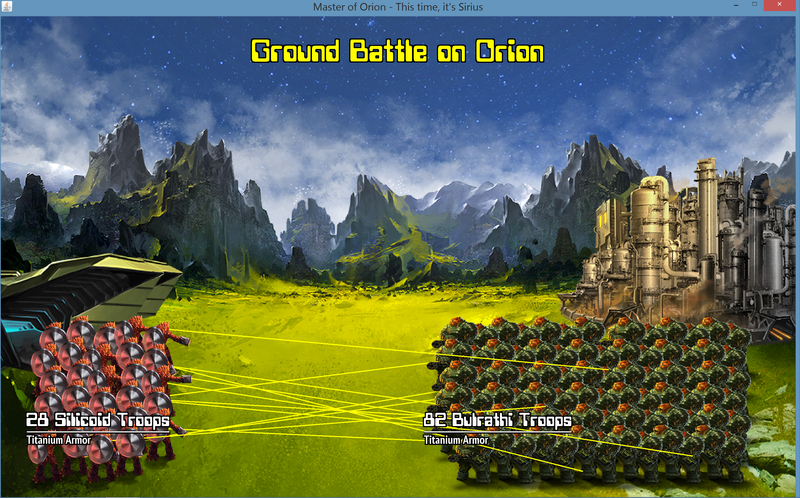 The soldiers keep a force field up, drop it to fire a weapon, then quickly raise it back up. You can see that in various stages in this screenshot. Below is a screenshot of Silicoid invaders getting slaughtered by defending Bulrathi soldiers. The artwork for the Bulrathi and their colony fortress is new. Currently, all soldiers are set to the same size but there will be racial differences in the final iteration of this screen, most notably with the Bulrathi (larger) and the Psilons (smaller). Also, the new Terran landscape has been integrated into the game. These landscapes are a little variable in that the sky and clouds can be different. Of course, there is no sky or clouds for airless planets, but the artwork is still in work for those. 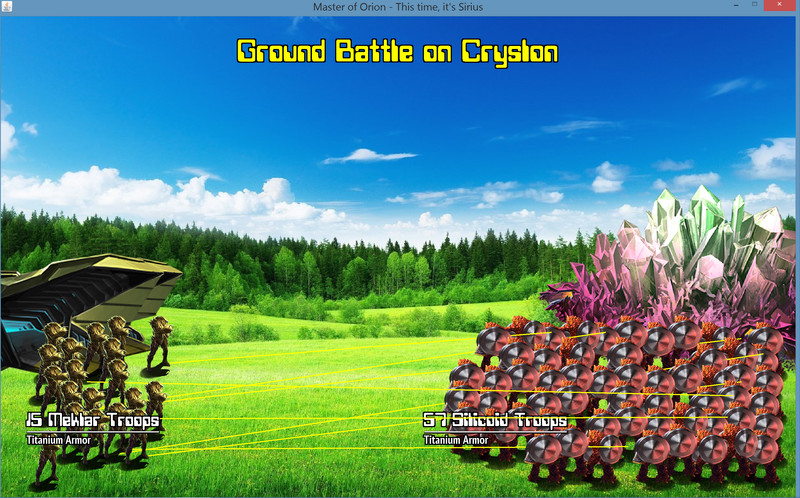 Below is an example of the current iteration of ground combat in Java MOO. 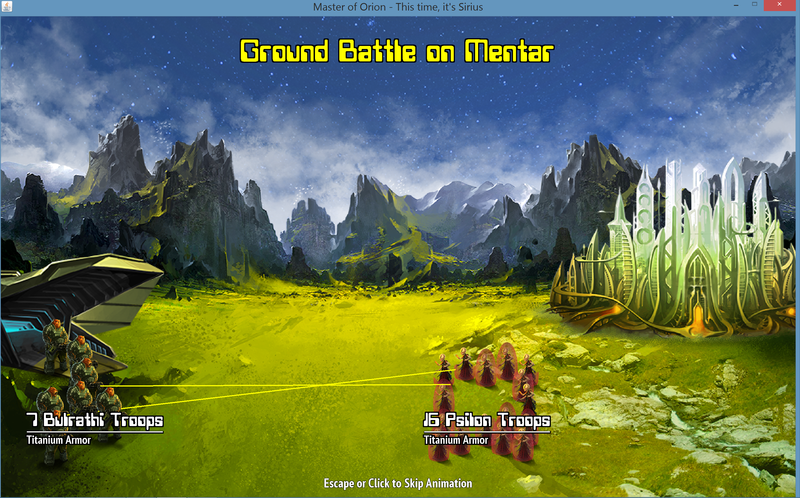 In this shot, Meklar forces are invading the Silicoid homeworld of Cryslon. It includes new artwork for the Silicoid soldiers and a typical colony. Hopefully you can tell that this is animated with firing back and forth as the forces try to kill each other. Currently, the background landscape is temporary as are the weapon shots going back and forth. There are also no corpse images yet. Those will vary based upon what kind of weapon the attackers have. The landscape and colony illustrations are currently in work, and a lot of behind-the-scenes coding has been going on to integrate the new images into the colonization and ground combat animations. Below are some example illustrations. This one is the new Terran landscape, a transport ship, a Meklar colony with shield, and the Meklar ground combat troops (shown larger than in-game scale). Eventually, each race will have their own colony and transport ship illustrations. The architecture of the Meklar colony is patterned after the art deco architecture in the movie Metropolis. Keep in mind that, during ground combat, these soldiers are animated and fire weapons at each other. The Silicoid colony and troops are currently in work.